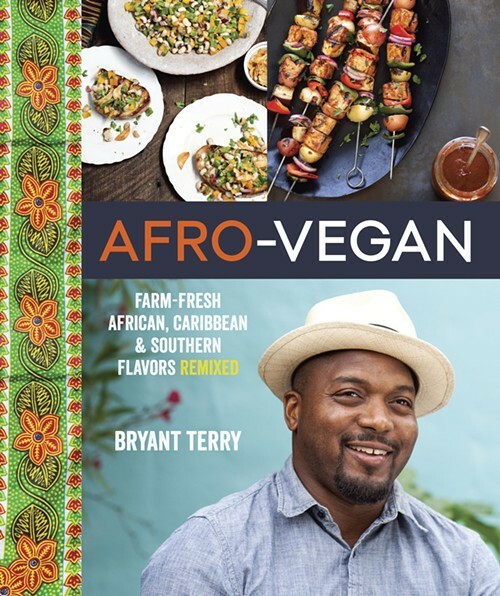 Bryant Terry opens the introduction to his new cookbook, Afro-Vegan, by recounting a search-engine query for “African-American beans” — a search whose first page of results, he explains, yielded not one article about the types of beans that have historically occupied a place of honor in African-American cooking. There were no recipes for long-simmered green beans, no paeans to Creole red beans and rice, or to black-eyed peas. Instead, there were multiple links to articles about black beans — that staple of Latin-American cuisine — and one about the film Catfish in Black Bean Sauce. And so Afro-Vegan puts the traditional foods of the diaspora — whether it be people who settled in Morocco, Jamaica, or Terry’s own native Tennessee — front and center. It is a vegan cookbook that Terry hopes curious omnivores will also find inspiring. And, perhaps more than anything, it is a book that Terry hopes will instill in folks of African descent some sense of pride and ownership. Terry, the Oakland-based vegan chef and food justice advocate, has never been shy about mixing food and politics. His most well-known book, 2009’s Vegan Soul Kitchen (which propelled him to “celebrity chef” status), was an effort to reclaim African-American cooking traditions in the face of widespread vilification — all those articles about how soul food is killing black people. Vegan Soul Kitchen was a cookbook, but it was also a series of history lessons proving that African-American food hasn’t always been, and needn’t be, all mac ’n’ cheese and meats cooked in rendered animal fats: Just a couple generations ago, many black Americans had an everyday diet that consisted mostly of nutrient-dense leafy greens, legumes, beans, and tubers. “If we want to address this public health crisis among people of African descent, we needn’t look beyond our cultural foods,” Terry said. Afro-Vegan takes that same central argument and extends it to cover not just traditional African-American dishes but the entire spectrum of foods eaten and developed by people in the African diaspora, using a mix-and-match approach inspired by the collages of Romare Bearden. For instance, for one recipe Terry tops creamy Southern-style grits with slow-cooked collard greens, which he describes as a version of Ethiopian gomen wat. And Terry’s recipe for a tomato-garlic broth features hominy (a staple of both the American South and Afro-Caribbean cuisine) and the flavor profile of efo riro, a Nigerian stew. Discussion about ethical eating and “slow” food inevitably raises the question of whether those lifestyle choices are only accessible to the wealthy. One of the things I appreciate about Afro-Vegan is how down-to-earth, and even frugal, many of the recipes are. There’s one recipe for making a stock using leftover corncobs; there are dozens of others — for hand-mixed spice blends, pickled vegetables, and simple cooked grains — that don’t require more than a vegetable or two in addition to items that most home cooks already have in their pantry. Terry said he tried to be mindful of the fact that not all of his readers would have access to a Whole Foods or a fancy natural-foods co-op. Indeed, Terry said he can’t help but feel hopeful when he looks at the changes that are already occurring in places like West Oakland, where a grocery store (and another on the way) and an abundance of urban farms and community gardens have sprouted up in the past few years, bringing fresh fruits and vegetables to what has been a so-called food desert. “I know that folks are figuring out how to make a way,” he said. Terry will speak at the Oakland branch of Whole Foods (230 Bay Place) at 6:30 p.m. on Tuesday, April 22 — Earth Day — as one of the headliners for this year’s Oakland Veg Week (April 21-26). In addition to his talk, Terry will do a brief cooking demo and sign copies of Afro-Vegan.